Ford F-Series, the No.1-selling truck in the United States for 20 years, will expand its lineup in the first quarter of 2000 by introducing the 2001 model year F-150 SuperCrew. The new entry will be the first under 8,500-pounds GVW truck with four full-sized doors and a full rear passenger compartment. A unique evolution of the Ford 150 pickup, the F-150 SuperCrew provides the comfort and interior package of a heavy-duty CrewCab truck with the versatility, ride, handling and garageability of the light-duty SuperCab pickup. "It's the ideal vehicle for business customers and growing families who need more interior space to go with the ruggedness and utility of a pickup," said Jim O'Connor, a Ford vice president and Ford Division president. Major attributes of the new F-150 SuperCrew include a cab that is 12 inches longer than the F-150 SuperCab, providing best-in-class rear-seat roominess; four conventional doors for the easiest entry and egress of all the pickups available in the U.S. and a fold-flat, Expedition-like 60/40 rear seat that provides passenger comfort unmatched by any other light pickup. Other significant F-150 SuperCrew features include an enclosed storage compartment that makes it possible to have an optional 6-disc CD player with a front bench seat, a unique 5 1/2-foot box design with steel inner and composite outer panels and the same overall length as the short wheelbase SuperCab for better maneuverability and garageability than other crew cab models. Standard engine for the F-150 SuperCrew is Ford's highly dependable, smooth and powerful 4.6-liter Triton V-8, with the 5.4-liter Triton as an option. Also standard is XLT trim, rear-seat reading lamps, cupholders, and door map pockets. Industry firsts on SuperCrew are rear child-seat tethers, a rear-seat power point and power-adjustable brake and accelerator pedals, all standard. Other standard SuperCrew features include privacy glass for the rear doors and backlight, four-wheel anti-lock brakes, air conditioning, power windows and locks, aluminum wheels, and on the 4x4 model, electronic shift on the fly. For improved functionality of the pickup bed, a Bed Extender will be introduced soon after the vehicle launch. An optional power glass moonroof with a unique overhead console is also available. In addition to the new SuperCrew, the F-150 line for 2000 has a host of new comfort and convenience features in a lineup simplified by the dropping of the light-duty F-250 nomenclature. New overhead console and left and right side visor vanity mirrors standard on XLT and Lariat F-150 pickups, optional on XL models. Driver's side keypad entry system available on Lariat models. Chromed steel wheels and 17-inch OWL tires - previously available on 4x4 models only - available on 4x2 models as well. The under 8,500 GVW F-250 has been discontinued. The over 8,500 GVW F-250 Super Duty remains a cornerstone in the overall F-Series lineup. Functions previously handled by under 8,500 GVW F-250 pickups now go to a new F-150 7700 payload group with all of the attributes of the F-250, including heavier frame, larger brakes, higher-capacity wheels and 8,800 pounds towing capability. F-Series' standard 4.2-liter V6 is the most powerful V6 engine in a full-sized pickup. The optional 4.6-liter Triton V-8 is teamed with a five-speed manual or automatic overdrive transmissions, while only the automatic transmission is matched with the 5.4-liter Triton V-8. The Triton V-8 engine line features 100,000-mile tune-up intervals and a fail-safe cooling strategy to protect engines from seizing in the event of coolant loss. The F-150's 2,385-pound maximum payload rating also is best-in-class for a half-ton pickup and the 4x2 regular cab model's 8,500-pound maximum tow rating is tops in its class. F-150 natural gas, bi-fuel natural gas and bi-fuel propane vehicles will continue to be available. 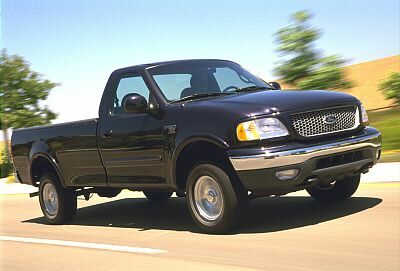 Ford sold 836,629 F-Series pickups in the United States in 1998 making F-Series the No. 1-selling truck in the U.S. for the 20th straight year. F-Series trucks are built at Ford assembly plants in Kansas City, Missouri, Norfolk, Virginia, Oakville, and Ontario; and for Super Duty only, Lousville, Kentucky.